← Why should I wear the Hijab? Hijab is an Arabic word meaning ( حجاب )barrier or partition. In Islam, however, it has a broader meaning. 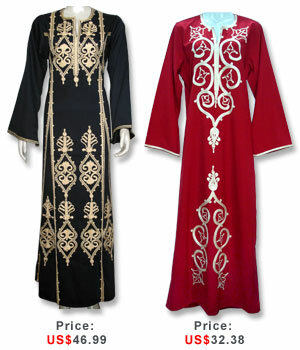 It is the principle of modesty and includes behaviour as well as dress for both males and females. The most visible form of hijab is the head covering that many Muslim women wear. Hijab however goes beyond the head scarf. In one popular school of Islamic thought, hijab refers to the complete covering of everything except the hands, face and feet in long, loose and non see-through garments. A woman who wears hijab is calledMuhaajaba. Hijab does not need to be worn in front of other Muslim women, but there is debate about what can be revealed to non-Muslim women. Modesty rules are open to a wide range of interpretations. Some Muslim women wear full-body garments that only expose their eyes. Some cover every part of the body except their face and hands. Some believe only their hair or their cleavage is compulsory to hide, and others do not observe any special dress rules. In the English speaking world, use of the word hijab has become limited to mean the covering on the head of Muslim woman. However, this is more accurately called a khimaar. The khimaaris a convenient solution comprising usually one, but sometimes two pieces of cloth, enabling Muslim women to cover their hair, ears and neck while outside the home. Hijab, in the sense of veiling, can also be achieved by hanging a curtain or placing a screen between women and men to allow them to speak to each other without changing dress. This was more common in the early days of Islam, for the wives of the Prophet Muhammad. This entry was posted in Uncategorized and tagged Hijab, khimaar, Muhaajaba, Muslim women, Prophet Muhammad. Bookmark the permalink. A further issue is that video games can be serious anyway with the key focus on learning rather than leisure. Although, it has an entertainment feature to keep children engaged, just about every game is frequently designed to work with a specific experience or curriculum, such as instructional math or scientific disciplines. Thanks for your article. I just want to mention I am just beginner to blogging and site-building and honestly loved you’re blog. Most likely I’m planning to bookmark your blog . You absolutely have fantastic articles. Thanks a lot for sharing your web-site. I simply want to tell you that I am new to blogging and truly savored your web-site. Probably I’m going to bookmark your website . You surely come with superb article content. Cheers for sharing your blog. This is exactly what I had been seeking! Have you thought to right away thought to look up to you, but I proceeded to go as a child inside fog in some other sites. Do not forget that the simplest options work most effectively. We’ve a concept: start to supply training for how to might prepare articles that is study. Since Concerning read through too much information online right here touched on, however your article really trained me in just what exactly I needed to be aware of. Everything is very amicable with a cloudless rationalization of the issues. It was especially informative. Your website is vastly helpful. Show gratitude you for sharing! I comparable the helpful info you provide in your articles. I’ll bookmark your blog and check once more at this juncture repeatedly. I’m fairly dependable I will learn several new to the job things acceptably here! Sunny break for the next! Whats up same polite website!! Man .. Admirable .. Superb .. I’ll bookmark your web situate and engage the feeds additionally…I am cheerful to find many useful information here surrounded by the situate awake, we’d comparable flesh out added strategies in this regard, thank you for sharing. . . . . . Thank you for every other magnificent post. The place else may just anybody get that type of info in such a perfect method of writing? I’ve a presentation next week, and I’m on the search for such info. Thanks for your post we are now working on it. cheap ugg boots on What is a Jilbab? Gaige on What is a Jilbab? Ellis on Why should I wear the Hijab? facetime for android iphone on What is a Jilbab? Aparajita on What is a Jilbab?